Our passion is football. 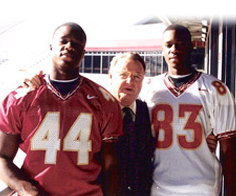 Football gave Devaughn and me the opportunity to meet some of our best friends, learn what it meant to be part of a team, pursue the gift of higher education free of charge, and play on one of the biggest football stages in the country: Florida State University. Football, we knew, would give us the opportunity to pursue our dreams. 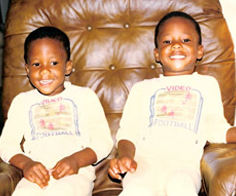 On April 16, 1982, Devaughn Stephen Everett Darling and I were born in Nassau Bahamas around seven in the morning. 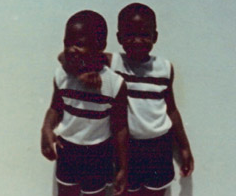 At the time, no one knew there were two of us; the doctors heard one beating heart. 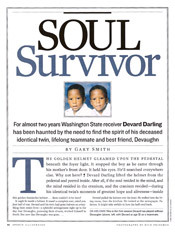 In fact, it wasn’t until I came out with Devaughn’s hand gripping my ankle, did anyone know there was a second Darling to be born into this world. Doctors explained this seemingly amazing happenstance on the fact that our hearts must have been beating simultaneously; our two hearts were beating AS ONE. On that day in Nassau, Bahamas , there was no football. 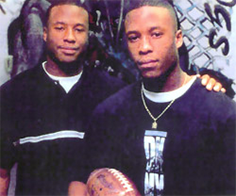 On that day, no one knew two young hearts would enter the world and desire to make a change in the Bahamas using the game of football. Almost 12 years later, we moved to Houston, Texas. We learned play football and loved it! We actually ended up being pretty good at it and were recruited by several Division I universities. We chose the defending National Champions Florida State University Seminoles. Our freshman season was all that was promised: exciting, tough, fun, tiring…amazing! We knew our dream of playing football in the National Football League was not far away. On February 26, 2001, God had another plan for us. 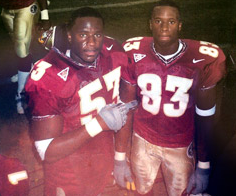 My confidant, my twin brother, and my best friend passed away preparing for another upcoming football season at FSU. On his official death certificate it states the cause of death to be “physical overexertion.” Devaughn worked for the game we loved, the game we had so much passion for, and for the game we had build so many dreams upon. It is our dream – our vision – to bring the game of American football to the country of the Bahamas, where young Bahamians still do not have the opportunity to play. This dream starts with instituting the game of football into the Bahamian culture. This organization is the first of many steps to providing young Bahamian athletes with the same opportunity afforded to Devaughn and I: to meet best friends, learn what it means to be part of a team, pursue a degree in higher education, get a full scholarship, and even possibly pursue a professional football career where the ability to give back to our great country is dramatically increased. It is my prayer that my story, my passion, and my drive will lead you to read this website and support the As One Foundation. Please continue your journey through our site and discover your critical role in making our dream a reality.